Even though you may have smiled, frowned, laughed, and made other expressions without concern when you were younger, you may now be noticing that the facial wrinkles created by these expressions are staying, even after your face has relaxed. These lines are actually called dynamic wrinkles, and they're caused when the facial muscle stays contracted from overuse, forming an etched line in the overlying skin. Xeomin is an injectable wrinkle relaxer that, like BOTOX, temporarily relaxes the treated facial muscle with a strain of purified botulinum so your wrinkles look softer and smoother. At Novo Med Spa in Frisco, TX, we offer a number of cosmetic and medical skin care services similar to Xeomin nonsurgical wrinkle relaxing treatments. Schedule a consultation with our team today to learn more about Xeomin. "I absolutely love this place. The staff made me feel so welcomed and relaxed. Not only did I feel comfortable, but I saw real results. I have severe acne scarring and I saw great results from just one treatment. Stephanie was absolutely amazing. She thoroughly explained different facial treatments and which treatments would work best for my skin and the results I wanted to see. She was so kind and I can't wait to go back." "From the moment you walk in this place is adorable! Love the staff, Stephanie is incredible! They seriously fixed the my skin after years of struggling with acne and red spots. Go in for a consultation and they will recommend the best service for your skin!" "Novo Med Spa is WONDERFUL! I've received three IPL photofacials and the redness that I've lived with on my face for years is completely gone! Stephanie was great and made sure I was comfortable throughout the whole treatment. I highly recommend Novo Med Spa!" "This was my first laser treatment experience and Novo Med Spa went above and beyond my expectations. I came in for the IPL and Stephanie, my provider, was knowledgeable and professional from beginning to end. Her pleasant voice was relaxing and she was conscious at all times to make me feel comfortable during the procedure. All staff are friendly and I am looking forward to my next visit to Novo Med Spa as well as an improved complexion." "I LOVE Novo!! I am always beyond pleased with my results, especially with Stephanie. I have been to other med spas and Novo is above the rest!" 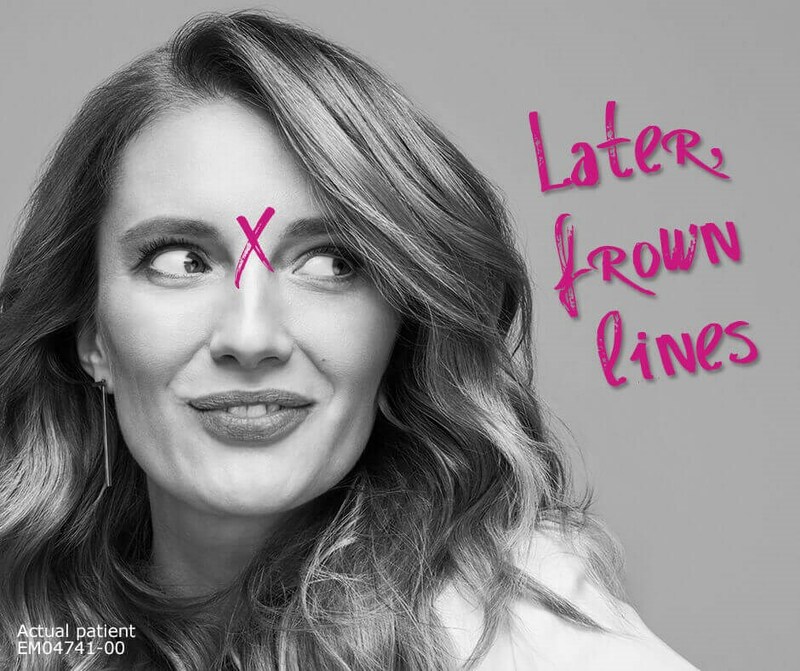 Xeomin helps to diminish the appearance of dynamic wrinkles on your face, including frown lines, forehead lines (nonsurgical brow lift), bunny lines, Crow's feet, and Marionette lines. It can also be used for a lip flip, excessive sweating (hyperhidrosis), and TMJ pain. Ideal candidates for Xeomin are in good overall health, not pregnant, and have never had an allergic reaction to any other botulinum toxin products, including BOTOX and Dysport. Talk to us during your consultation about your current medications, cosmetic goals, and medical history so we can create your Xeomin treatment plan for your best results. Xeomin treatments usually take less than 20 minutes and can be performed in one of our procedure rooms at the conclusion of your consultation. The areas of the face being treated will be sterilized before Xeomin is gently injected with a fine-gauge needle. The treatment is quick and generally does not cause great discomfort so local anesthesia is not required but can be requested during your consultation. Pressure and cold compresses will be applied to the injection area to prevent minor bleeding prior to your return home. You will be permitted to leave our office after receiving your Xeomin treatment to resume your normal activities, but vigorous exercise should be avoided until the next day. You may want to sleep with your head elevated and use cold compresses periodically to speed healing and results. For a few days following a Xeomin injection, you may experience some bruising, swelling, and redness near the injection sites, but this is no cause for concern and can be easily concealed with makeup. Many individuals notice obvious improvements 3 – 4 days after their Xeomin injection that should last approximately three months. Repeat injections at Novo Med Spa can be scheduled to sustain your results. Age brings some great gifts, such as experience and wisdom, but it can also come with some unwanted changes, like facial wrinkles and lines. Relax and smooth out dynamic wrinkles on your face with Xeomin wrinkle relaxer treatments at Novo Med Spa in Frisco, TX. Set up a consultation now with our team to build your specialized Xeomin treatment plan.